Round 1: With blue, 6 sc in magic ring, do not join. Round 3: *1 sc in next sc, 2 sc in next sc*, repeat from * to * around, do not join (18 sc). Continue working 1 sc in each sc around until piece is 1″ tall, ch 1. Make 1 sc in these sc, then make 2 hdc and 1 sc in same sc, sl st in each of next 5 sc in both layers, ch 1, [1 sc, 2 hdc, 1 sc] in next sc, sl st in last sc on the edge, fasten off. Weave in end. Row 1: With light blue, 3 sc in magic ring, turn. Row 2: ch 1, sc in first sc, 2 sc in next sc, sc in last sc, sl st in magic ring, fasten off, leaving a long tail for sewing. Embroider nose on snout with brown yarn. Sew snout to head. Sew on eyes. 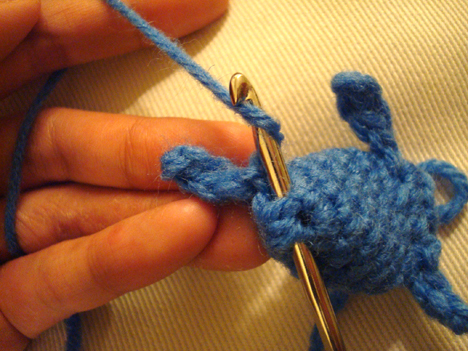 Sew french knots on the ears with light blue yarn. Second last row: *1 sc in next sc, 2 sc tog over next 2 sc*, repeat from * to * 3 more times. Last row: 1 sc in each sc around. Fasten off, leaving long tail for sewing. Arms are attached between first and second rows from the top of body, and legs are attached between last and second last row of body. Attach yarn to the st where the arm/leg would be, like so. Cut yarn. 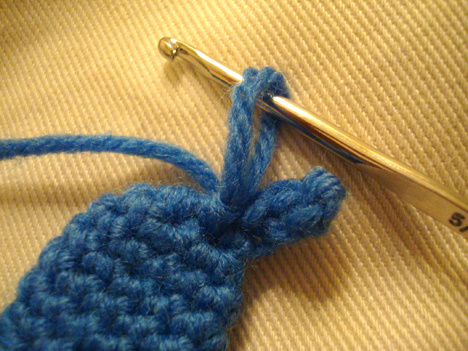 Insert hook through the stitch where the 2nd leg will be AND the stitch where the first leg is attached, and pull the yarn through. 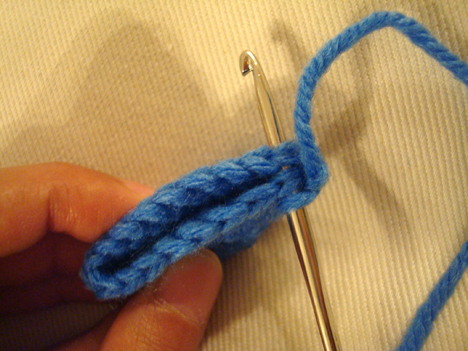 Insert hook in the stitch where the 2nd leg starts and make 1 sc in the stitch. ch 4, sc in 2nd ch from hook, sc in each of next 2 ch, sl st in the st where the leg is attached, fasten off, weave in ends. 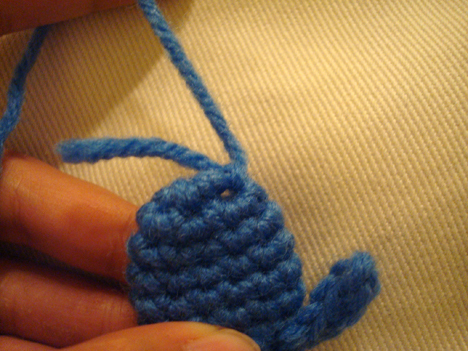 Do the same for the arms, except use sl st instead of sc when crocheting down the arms. Using long tail from body, sew body to head. 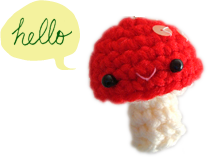 I also made a french knot for a tiny tail. Oh my goodness does he put a smile on my face! You just couldn’t be more perfect, wee bear!!! 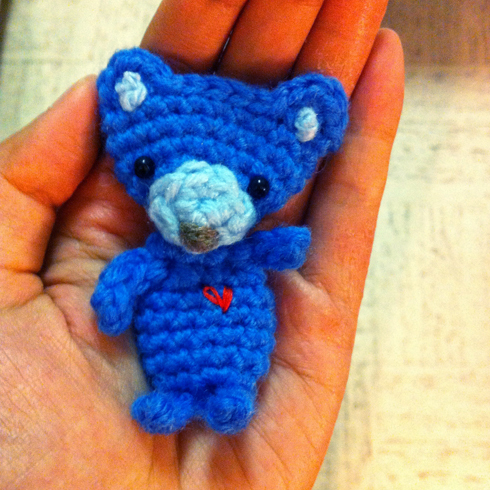 Pingback: Crocheting stuffed animals from Top This! yarn.